Once you have input your data, the software will present your Base Plan—a complete lifetime roadmap for your income, spending, savings and life insurance needs. You can return to this Base Plan at any time to update with new information or expectations, or to see how your plan is impacted when trying to make life-changing decisions—whether to take a new job, when to buy a new home—or everyday decisions like how much to budget for groceries or entertainment. 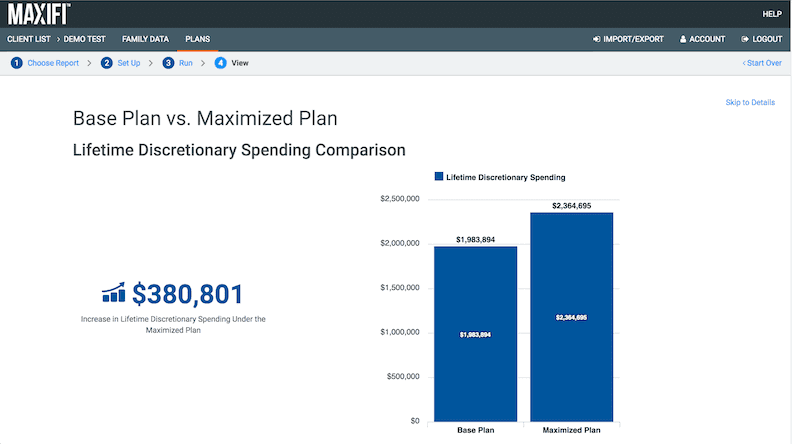 Once you’ve created your Base Plan, MaxiFi's optimization engine can analyze thousands of scenarios to find ways to safely raise your annual discretionary spending—potentially increasing it by hundreds of thousands of dollars over your lifetime. When you're happy with your Base Plan, set up your Progress Tracker for the year with a few clicks. 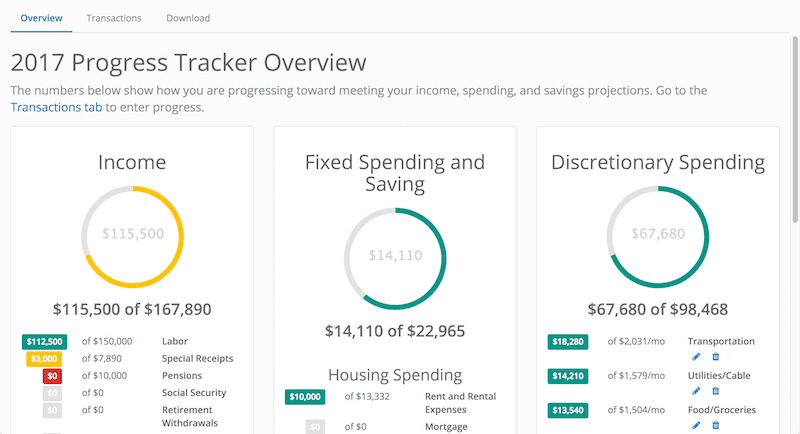 This tool helps you keep on track to meet the key spending and savings numbers in your plan. It also allows you to make sure your income expectations for the year match your actual income. 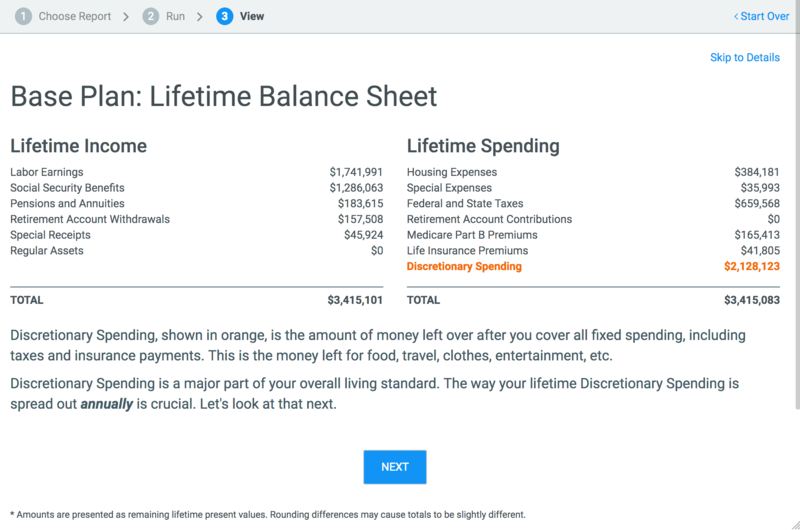 MaxiFi's Living Standard Monte Carlo analysis feature shows the impact of different investment strategies and spending behaviors on your bottom line – your living standard. 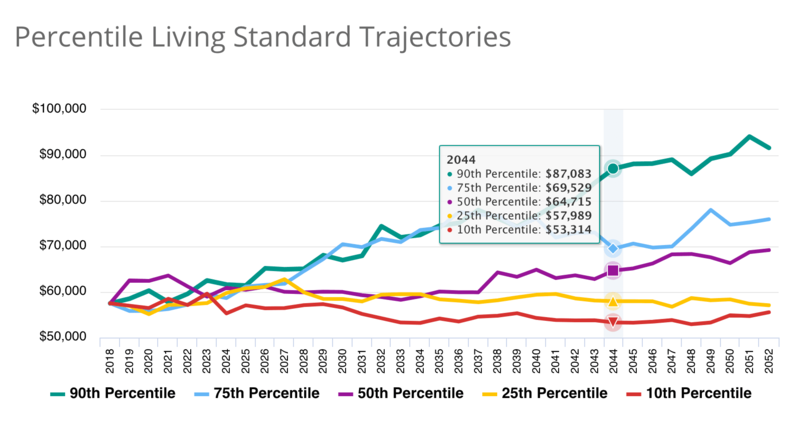 Our Monte Carlo analysis simulates hundreds of living standard trajectories you might experience given your investing strategies and spending behavior. Adjust your investment strategies and spending behavior to generate different sets of trajectories until you achieve the right balance of risk and reward. Use our pre-set common investment strategies, such as shifting from a stock-heavy to bond-heavy portfolio as you age, to quickly assess risk and reward. Use our pre-set common assets--with decades-long return histories--to define alternative investment strategies. You can also define your own assets. 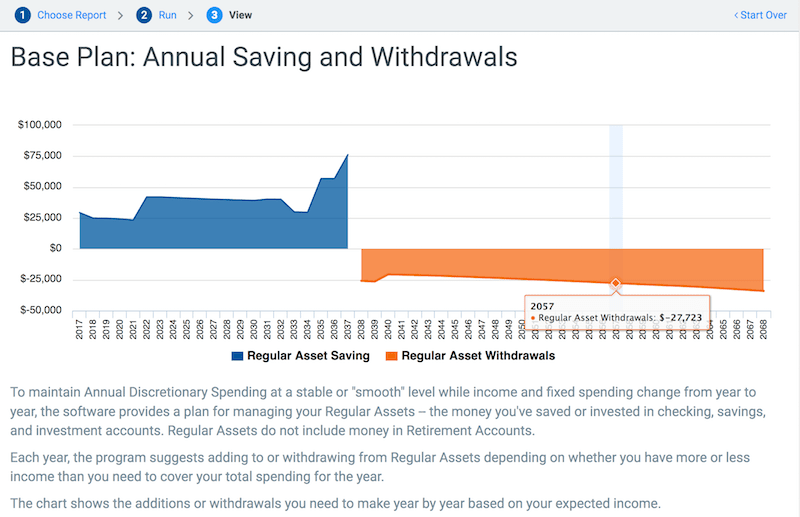 Based on years of research and fine-tuning, MaxiFi’s Economic Security Computation Engine puts the most powerful, accurate financial planning approach into your hands. Find out what makes our software smarter and better. Our engine makes highly detailed annual Federal and State tax calculations and considers the full range of Social Security benefits. We allow you control over dozens of settings so you can model different maximum ages, inflation rates, changes to Social Security benefits or tax rates, and many others. Fully updated with Tax Cuts and Jobs Act of 2017 changes!